The first Bear Club pack of 2015 is packed full of hoppy goodness! There's the Victory Prima Pils, one of my favourites as well as heaps of IPS's/Pale Ale's and even Hendo's latest creation the Buggin' Out Black IPA. 3 Stouts from Norway, the USA and Queensland round out the pack. I'm excited about every beer in this pack, whether I've had them before on tap(Wolf of the Willows XPA & Deschutes Chasing Freshies), whether I've heard great things about them (Lervig Konrad & Moor Hoppiness) or because they seem like a genuinely interesting clash of styles (Weihenstephaner/BrewDog India Pale Weizen). I've had enough talking about which beers I'm looking forward to, it's time to drink them! The Weihenstephaner and BrewDog offering was the obvious starting point for me this month. It really lived up to what I was expecting, with Weihenstephaner and their wheat clearly keeping close control on BrewDog's usually heavy handed hop tactics. This beer brought together the Old World of Brewing (Weihenstephaner) and the New World (BrewDog) seamlessly. The beer is great and I really hope I can get myself some more. If you like your wheat beers it's worth seeking out. Chasin' Freshies is a seriously good beer! It's made by Deschutes, a brewery based in Bend, Oregon who make some seriously good beers! This one is particularly good and 1 I've now had a few times. The Mosaic hops are really prominent with tropical fruits, particularly passionfruit, as well as having some floral characteristics. There's a peppery spiciness that really adds to it. It's a beer that I think everyone should seek out! Wolf of the Willows' XPA was the next beer I got into in this pack. It's a beer that I've become very familiar with over the last few months and is simply sensational fresh! I would go as far to say that this is the best first up commercial offering we've seen in Australia in recent years! It's an American Pale Ale/Session IPA/XPA with plenty of citrus and passionfruit flavours and enough malts to balance the quite strong bitterness, especially considering it clocks in at under 5% ABV! If all Pilsner's were as good as the next beer in my Bear Club the world would be a very different place. Victory's Prima Pils was a real eye opening beer for me. I first had it not long after my first trip to Prague, where I really discovered good beer. It was the beer that opened my mind to the idea that American beer wasn't just Budweiser - something I'm oh so grateful I worked out! The floral hops in this are lovely but don't overpower the soft malts. There's a light citrus tang at the backend that accompanies a nice dry finish. This is the first time I've had it on tap and it's brilliant! Those who are following me on Twitter, yes I've finally joined you all (@Beeroclockau if you want to see me talk smack about beer), would know all about this next beer; Riverside Brewing's 77 IPA. I compared the bottle and Tru Bru offering last week (read about it here) and found out that they were very similar. It's a beautifully balanced IPA and one all Australian craft beer lovers should try! Hendo's latest (at time of pack release) was next up. Buggin' Out is a Black IPA that I have had numerous times recently and loved everytime! As I've said earlier this is a slightly thinner Black IPA than others available on the market, but that just makes it very very drinkable! If you see this one around the traps get your hands on it - it's a superb roasty IPA with plenty of hops. Death from Above is a beer that has previously been reviewed on Beer O'Clock Australia, you can find that review here. It was initially released at GABS in 2013 and was a real hit there! Subsequently there's been a couple of can releases and this is one of those. This self-termed Indochine Pale Ale is superb; with plenty of mango, a hint of cooling mint and less chilli than previous versions. It's still a brilliant beer and I can't wait to have my other cans! As regular readers would know, I'm a huge fan of cheese. This month's Bear Club had 3 stouts that recommended cheese as the ultimate pairing; the first being Norway's Lervig Aktiebryggeri Russian Imperial Stout; Konrad. Naturally I had it with a lot of cheese! It had a lovely thick body, coffee was the dominant flavour with roast and chocolate also present. Hoppiness from Moor Beer Company in the U.K. was the next beer I cracked into. It was a really nice dry IPA with plenty of citrus hops combining with a strong caramel malt base. It was almost an American IPA but had a distinctly English twist to it. It's one to look out for. 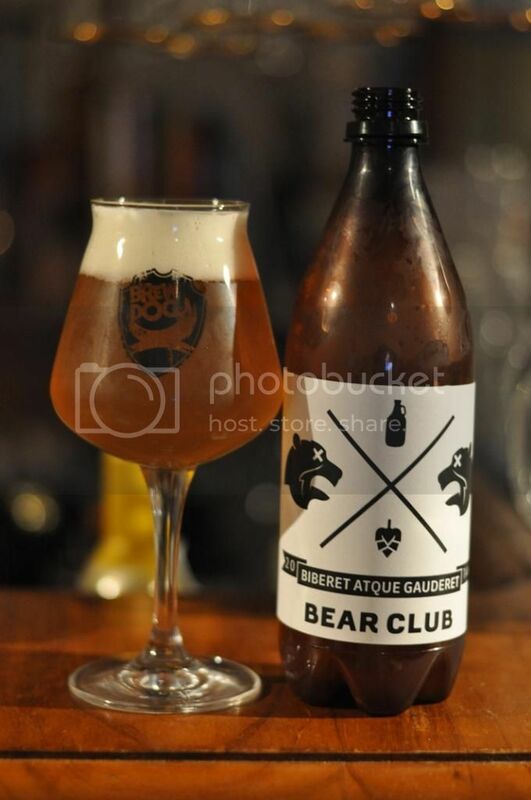 The second canned and final canned beer in this Bear Club was also from the Garage Project. Their Hop Trial range is a collaborative effort between them and NZ Hops and Plant & Food Research. This is #2, it's not quite as good as the first one but there is plenty of citrus and rock melon as well as a bit of pine. The whole point of these beers is research so if you happen to grab one make sure you fill in the survey! #2 only had 137 respondents, including myself. Get it together guys! Sixpoint are quickly becoming my favourite brewery. 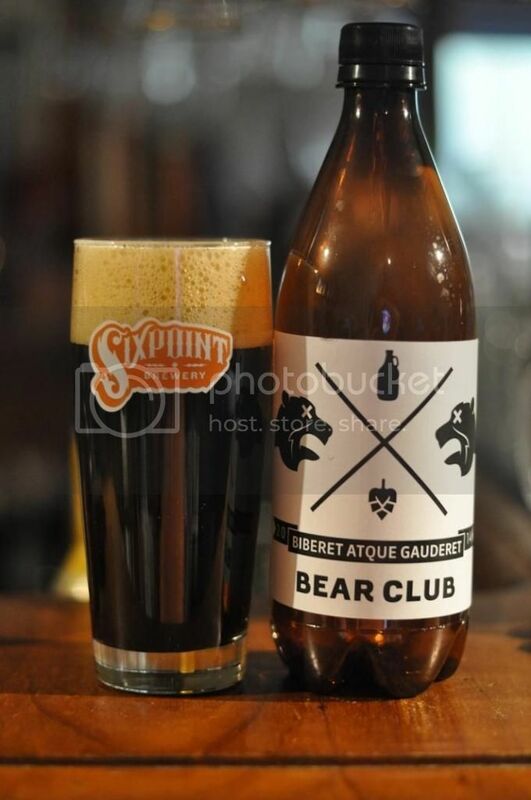 Their Otis, an Oatmeal Stout, was the penultimate beer in this Bear Club. Oatmeal is in my opinion a vastly underutilized ingredient in brewing, it adds so much creaminess. This beer is no exception with heaps of creaminess combining beautifully with roast. I would definitely keep an eye out for this. I think I saved the best beer for last! 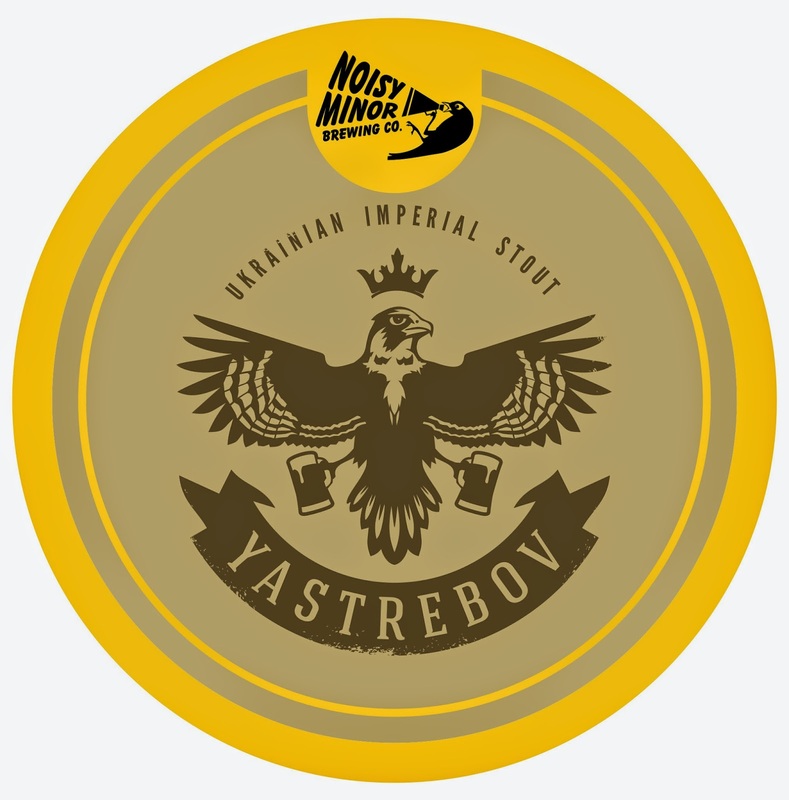 The Noisy Minor Yastrebov, a Ukranian Impeial Stout (I'm assuming it's for all intents and purposes a Russian Imperial Stout) is a phenomenal example of the style with treacle, roast and caramel all highly prominent. It's a wickedly thick drop, which is still ridiculously drinkable even at almost 10% ABV! Seek this one out stout lovers! January '15 was a great Bear Club! Anton has told me that February will be even better, and the few sneak peeks I been given would seem to confirm that on paper. The stouts in this pack really stood out to me, all 3 were excellent. The Chasin' Freshies from Deschutes is another absolute favourite, the cafe/beer place near work has had it on keg a few times and I've enjoyed it everytime they've had it, so keep an eye out for that. Until next time guys!